The noble principality of Sealand is looking to welcome and honour new members of its prestigious peerage. This is no mere manor or grounds, Sealand is the world’s smallest state and a celebration of freedom and individuality. Its courageous people have already fought off the elements, and even invasion. Barons were traditionally knights of warriors that had pledged their allegiance to a king or prince. In fact, the word itself comes from the Old French and means freeman or warrior. Prince Charles himself holds the title of Baron (among others). The question is – are you, or someone you know, ready to join their ranks? Your new homestead is in international waters, seven miles off the eastern shores of Britain, but the appeal of holding a title reaches far further. Sealand is a micronation and as such has the right to issue these legal titles with a range of aristocratic names and honours – from lords to counts to barons. You won’t get a seat in the House of Lords but the titles issued are legal. Your new life as emissary of Sealand could be about to begin. And when your new baron title is conferred you would be in good company. Singer-songwriter Ed Sheeran, also known as Baron von Edward Sheeran of Sealand, also holds the title. We’re delighted to have him as part of our Sealand royal family. He joined the ranks as he’s fascinated by the history of our proud nation. But perhaps you’re keen to get the best restaurant table by booking as a Baron? Or just looking for an unusual present for someone with aspirations? Here’s how buying baron titles works. Congratulations, you’ve made it to the digital realm of Sealand right here. Now your royal title is just around the corner. We’re proud to have a range of packages on offer to get you the perfect birthday gift, a Christmas present with a difference or just the chance to elevate your status for a bit of harmless fun. It’s easy to order online and you get a title pack with the history and geography of your new brave homeland. Order now and we’ll issue your pack, and title document, as soon as we can. Your Baron or Baroness title will last an entire lifetime, once your purchase a Baron title or a Baroness title you will be apart of Sealand’s royal peerage forever. How Long Does Delivery Take For A Baron/Baroness Title? We ship Worldwide and your Baron or Baroness title will be delivered within 5 – 10 days, no matter where the location. What Can I Do If My Baron Or Baroness Title Won't Arrive In Time? If you need your Baron or Baroness title for a gift we are able to supply every order with a PDF version of your title immediately. Does Sealand Keep A Record Of The People Who Purchase Baron Or Baroness Titles? Any Baron titles and Baroness titles recorded in the Royal Register are only known by the Sealand Royal Family. What Is Included In The Standard Baron Or Baroness Title Pack? 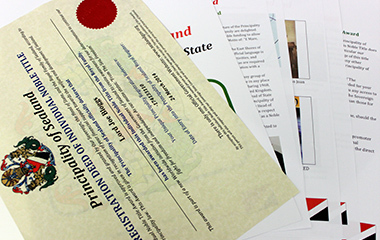 Your pack will include your Deed of Individual Noble Title Ownership, information of Sealand, History of Sealand, location information, photos and an official folder to keep your documents safe. What Is The Difference Between A Standard And Premium Baron Or Baroness Pack? 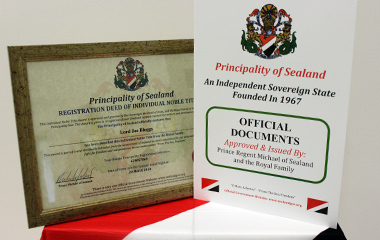 The Premium Baron and Baroness packs contain everything of the Standard packs with an additional premium framed deed personally signed by Prince Michael of Sealand.